Converting numbers from their conventional form into written and expanded forms is one way to start understanding place value. That nine digit in the hundreds place is something much different from a nine digit in the ones place, and these concepts are sometimes difficult to pickup. 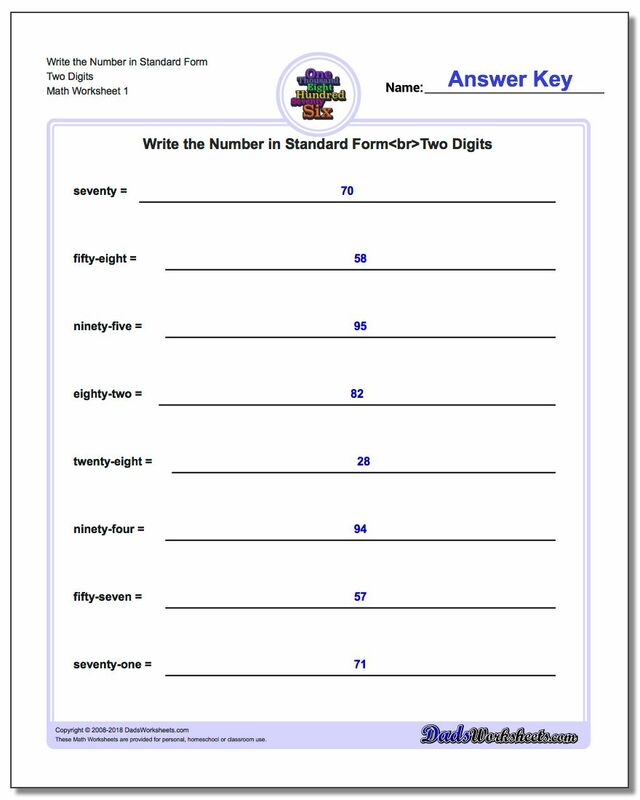 The worksheets on this page practice converting numbers between standard, expanded and word form to help build these concepts, and include worksheets with special edge cases that often trip up grade school students just staritng to explore place value. Practice worksheets for converting numbers from standard numeric notation into written (word form) notation. Writing numbers in word form is similar to the written word form used to fill out checks and some of these word form worksheets include variants with decimals appropriate for that topic. Practice worksheets for converting numbers from written notation (word form) into standard numeric notation. 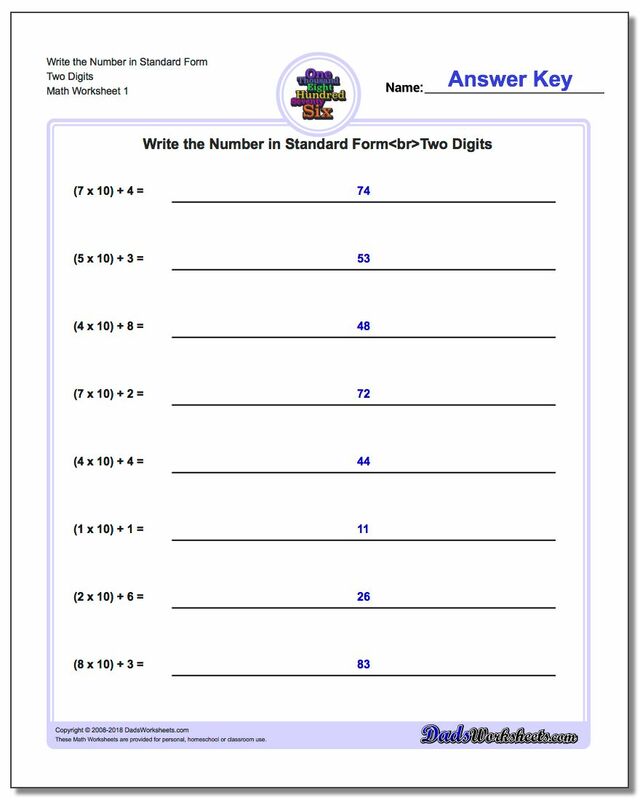 Practice expanded form worksheets for converting numbers from standard numeric notation into expanded place value form. Expanded form worksheets will help students understand place value concepts and be better able to understand the gaps in converting longer numbers with zero place values into word form or other representations. Practice worksheets for converting numbers from expanded notation (place value) into standard numeric notation. When we write numbers in standard numeric form, we make many assumptions that young grade school students need to learn explicitly. A good example is when we speak a number outload (in 'word form'), we skip over place values that have zeroes in them. This subtle discontinuity is something that can easily confuse students still struggling with place value, and you may see numbers like 'four thousand six' written as '46' as an answer. Whoops! 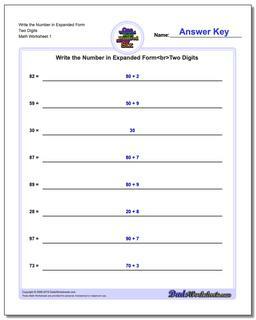 The printable worksheets on this page practice converting numbers to both expanded form and word form. This helps students focus on the place values of individual digits as well as increase understanding of how we pronouce numbers. The worksheets have problems of varying length (more digits!) convert different directions. Each different type of number conversion worksheetand when you might want to apply it is discuss in more detail below. 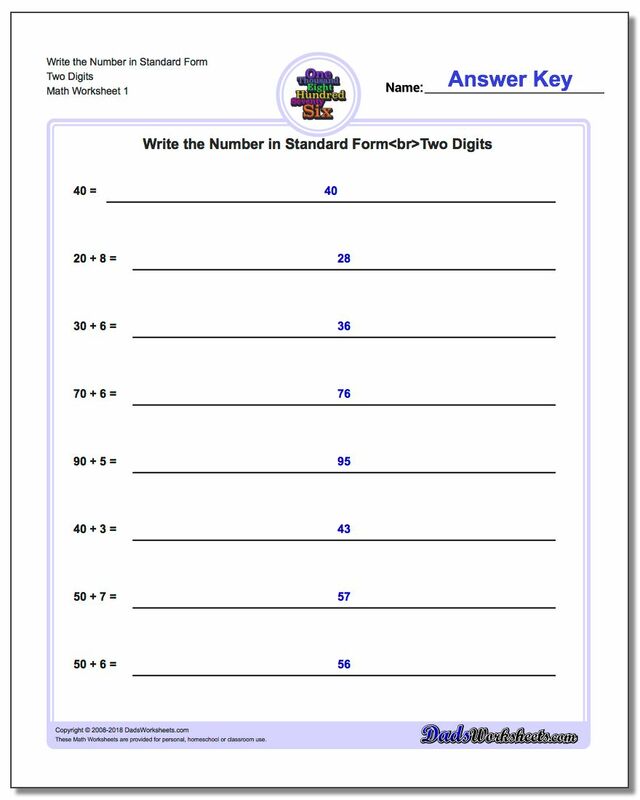 The worksheets on this page require the student to write numbers in expanded form, writing numbers in standard form and rewriting numbers in word form. Numbers themselves have a specific meaning, which is the exact count of the objects to which the number refers. There are several means of expressing a number, and each has a different role to play. However, when starting to understand place value, being able to convert numbers to expanded form or back is a very useful skill. The expanded form worksheets on this page are great practice for students learning about place value and a larger digit numbers. Expanded form is a way to write a number such that all of the place value components of the number are separated. When we write a number in expanded form, each digit is broken out and multiplied by its place value, such that the sum of all of the values equals the original number. The easiest way to visualize writing a number in expanded form is to see an example. Consider the number 1234. This number has three digits, so the expanded form representation of the number will have three components. When the number is written in expanded form, it is easier to understand the exact magnitude of each digit. In this example, even though the '1' in the thousands place is numerically smaller than the '4' in the ones place, the expanded form notation makes it clear that the place value connotes a much larger value even though the digit itself is smaller. The word form of this number is 'one hundred twenty three million, one hundred twenty three thousand, one hundred twenty three.' You'll notice that the typical grouping of numbers corresponds to where we introduce the words 'millions' and similar. The goal of the word form worksheets here is to develop a level of comfort with these period groupings. The word 'and' here tells us where the decimal place occurs and where we're about to start a word form description of the fractional or decimal component of the number. This is important not just in writing numbers in word form, but also when writing the numerical description of a dollar amount while writing a check or other legal description of money. There the part after the 'and' is usually described as cents. Either way, don't make the mistake of using the word 'and' anywhere while writing the word form of the wholes! Expanded form worksheets reinforce place value concepts by getting students to consider the actual value assigned to each digit in a number. Even though the process seems simplistic, by practicing converting to and from expanded form, your pupils develop a more innate number sense by being forced to consider not just the absolute value of a digit, but it's correspondence to its position in the entire number. A good place to start is either the earlier worksheets in the Place Value Expanded Form Worksheets or the Conventional Expanded Form Worksheets and then gradually work through these, incorporating expanded form exercises with decimals if you have convered those topics. Decomposing numbers into expanded form is somewhat more procedural than going to other forms, but once this skill is mastered any of the reverse Numbers From Expanded Form Worksheets will reinforce the concepts. You can choose to vary the complexity of the work you assign by selecting expanded form worksheets with longer digits or with decimal values, or simply mix these worksheets in as review assignments periodically, especially with students who seem to struggle with basic operations involved multi-digit problems. Regardless of what approach you choose, all of the worksheets on this page, including the expanded form worksheets, will provide help converting between different forms of numbers and teaching place value. Also be sure to check out the place value chart for help figuring out periods and other subtleties of place value!